These pages concentrate primarily on the language spoken by the Nyakyusa and Ngonde. The majority of the approximately 1 000 000 (1995 estimate) Nyakyusa live in the area north and north east of Lake Malawi/Lake Nyasa. In Tanzania their area extends to just around Mbeya city limits in the north and down to the lakeshore in the south. The eastern border is the Livingstone mountain range where the Safwa and the Kinga live. In Malawi, the language is called Ngonde and is spoken in the north-eastern corner north from Karonga town. The orange area indicates (possibly a bit exaggerated) the geographical extent of the Nyakyusa language. 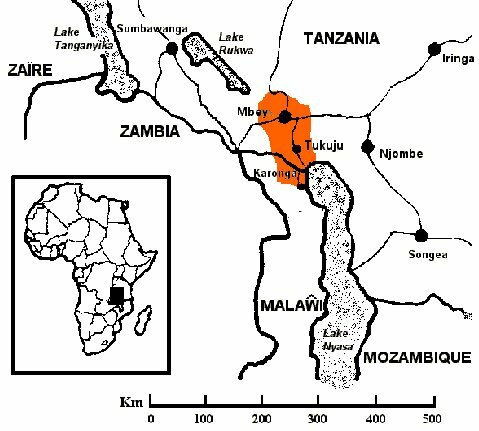 The main area (Nyakyusa/Ngonde only) is from just north of Tukuyu (Tukuju) and down to Karonga in Malawi.